For an overview of the reach of MEMRI's research, click here. MEMRI allows free access to its archives of over 8,000 reports from its Special Dispatch, Inquiry & Analysis, MEMRI Daily Brief, Special Report, Special Alerts, and Special Announcement series (click here to access all MEMRI.org series), as well as to the MEMRI TV Project archives, comprising nearly 7,000 translated clips from the Arab and Muslim world (click here to access all MEMRI TV clips). This project provides research about Islamist ideology and Islamist organizations that threaten the West, and also monitors groups that educate and preach jihad and martyrdom in mosques, school systems, and the media. This project monitors advocates of reform in the Arab and Muslim world, and the obstacles that they face in advancing their cause. The goal of this project is to provide reformists with a platform from which they can reach out to their societies and to religious, political, and educational leaders while also providing Western policy makers with a solid basis for long-term strategic plans aimed at supporting this effort. The full Reform Project archives are available to view here. The Antisemitism Documentation Project documents antisemitic themes in Arabic, Farsi, Urdu-Pashtu, and Turkish newspaper reports, editorials, and other media sources. This project maintains the largest archive in the world of translated material from the Middle East from the past decade. In 2009, MEMRI, in conjunction with The Lantos Foundation for Human Rights, dedicated the Lantos Antisemitism and Holocaust Denial Archives, which will be the repository of MEMRI's Antisemitism Documentation Project. The MEMRI TV Project, founded in 2004, has produced over 6,500 translated clips, comprising hundreds of hours of content, that have had over 100 million views online. MEMRI TV monitors over 100 channels from the Arab and Muslim world, and its clips are viewed in 197 countries. This project is vital to understanding the South Asian region that includes Pakistan and Afghanistan. Initially launched as the Urdu-Pashtu Media Project in January 2008, it was expanded as MEMRI's South Asia Studies Project in 2010. Since its inception, it has published reports and in-depth analytical research papers tracking and analyzing trends in Afghanistan, Pakistan, and India. The themes covered have included cultural and religious freedom, terrorism, and emerging threats to international security; all are of significant value to the international counterterrorism community. The 9/11 Documentation Project website is dedicated to the ideological roots of the attack. The website includes primary source material from the Arab and Islamic printed and electronic media, as well as from TV channels and other types of content published elsewhere. MEMRI already possesses the most extensive archives on these subjects, which it has accumulated over the past decade. Among the subjects included in this website's archives are written documents from Al-Qaeda and affiliate organizations, speeches and interviews by leaders of Al-Qaeda and affiliate organizations, wills and statements of the 9/11 perpetrators and their colleagues, and recruitment and indoctrination material of these organizations. The project also documents ongoing efforts to deny responsibility for 9/11 and to attribute it to others, through various conspiracy theories. This project is the only research project in the world that monitors, studies, and translates materials from the Iranian media on a day-to-day basis. 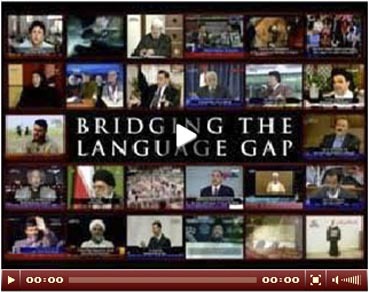 The project, which is headed by native-born Iranians, has produced hundreds of hours of translations from Iran's most important media outlets and websites, including over 40 newspapers and more than 16 TV channels, as well as hundreds of original analyses on issues of vital importance, such as Iran's pursuit of nuclear capability, the growth of the Iranian military, speeches by Iranian President Mahmoud Ahmadinejad, the increasing influence of the Iranian Revolutionary Guard Corps (IRGC), political unrest in Iran, Friday sermons from Iranian leaders, and much more. The project also monitors liberals and reformists in Iran, including the Green Movement, advocates of women's rights and human rights, democracy, and other issues. The MEMRI Cyber and Jihad Lab monitors, tracks, translates, and researches jihadi and other types of hacktivist groups and activity, including secular, emanating from the Middle East, Iran, and South Asia, and studies jihadis on social media and online, with a focus on their use of encryption and other technologies. It works with tech companies to help come up with solutions for dealing with jihadis and terrorists online, and with legislatures to help develop laws for tackling this phenomenon. It also assists the business community in matters of cyberattacks and cyber threats from these sources. Launched in January 2016 to do for Russian media what MEMRI does for Arab, Iranian, Urdu-Pashtu, and other Middle East media, the MEMRI Russian Media Studies Project publishes translations from the Russian print and broadcast media, in addition to original analyses. The project reveals what Russian officials, media, commentators, think tanks, and others are saying about the U.S., the West, and NATO, and other topics, in the government, military, academia, media, and other institutions. MEMRI's Board of Advisors and Directors comprises a group of distinguished figures in government, media, law and academia. Among them are former prime ministers; attorneys-general; justice ministers; leading legal and counterterrorism experts; and recipients of the most prestigious awards, including the Nobel Peace Prize, the Presidential Medal of Freedom, and the United States Congressional Gold Medal. This group also includes former United States government officials, such as White House National Security adviser, former Director of the Defense Intelligence Agency; former NSA Director; former Director of the CIA; former Secretary of the Navy; former Director of Operations with the FBI; former Deputy Commander of the U.S. Cyber Command; Former Congressmen; former Secretary of Education; and Ambassadors to the United Nations, Iraq, the European Union. Members of MEMRI's Board of Advisors are bipartisan and have honorably served Presidents Jimmy Carter, Ronald Reagan, George H.W. Bush, Bill Clinton, George W. Bush, Barack Obama, and Donald Trump. Oliver "Buck" Revell, Chairman; Former FBI Executive Assistant Director (Investigations) in charge of Criminal Investigative, Counter-Terrorism and Counter-Intelligence programs; former Vice Chairman of the Interagency Group for Counterintelligence, former member of the Senior Review Group of the Vice-President's Task Force on Terrorism; and currently President of The Revell Group. Alberto M. Fernandez, President of the Middle East Broadcasting Networks (MBN), former Vice President of MEMRI, former State Department's Coordinator for the Center for Strategic Counterterrorism Communications, former U.S. Ambassador to the Republic of Equatorial Guinea, former Chief of Mission in Sudan, and former Director for Near East Public Diplomacy. Jeffrey Kaufman, Counsel; a leading intellectual property lawyer with offices in the Washington, DC area. Robert R. Reilly, Director of the Westminster Institute, former Senior Advisor at the Department of Defense, former director of Voice of America, Special Assistant to Ronald Reagan, and author. Michael Mukasey, Former U.S. Attorney General and Judge of the United States District Court for the Southern District of New York. Yigal Carmon, MEMRI's President and founder, former chief counterterrorism advisor to Israeli Prime Ministers Yitzhak Rabin and Yitzhak Shamir, and senior delegate to the 1991 Madrid Peace Conference. Steve Stalinsky, Executive Director of MEMRI. Anna Mahjar-Barducci, Project Director of the Russian Media Studies Project, and author. Marine Lt. Gen. Vincent Stewart, Chairman of MEMRI's Board of Advisors, former Deputy Commander of the U.S. Cyber Command and former Director of the Defense Intelligence Agency. GEN (Ret.) Michael V. Hayden, four-star Air Force general, former NSA Director and CIA Director. GEN (Ret.) Keith Alexander, founder and CEO of IronNet Cybersecurity, four-star Army general, first commander of the U.S. Cyber Command, and former NSA Director and Central Security Service Chief. James Woolsey, Former Director of Central Intelligence Agency and Under-Secretary of the Navy. John Bolton, White House National Security adviser, former US Ambassador to the United Nations. Jose Maria Aznar, former Prime Minister of Spain. Ehud Barak, Former Prime Minister of Israel. Natan Sharansky, rights activist and former Israeli cabinet minister. Irwin Cotler, former Minister of Justice and Attorney General of Canada. Peter Hoekstra, Ambassador to the Netherlands, former Chairman of the House Intelligence Committee and 9-term member of U.S. House of Representatives from Michigan. John Ashcroft, Former US Attorney General and U.S. Senator (MO). Paul Bremer, Former head of the Coalition Provisional Authority in Iraq. Stuart Eizenstat, former Ambassador to the European Union. William John Bennett, former Secretary of Education. Imam Hassen Chalghoumi, French-Tunisian Imam of the Drancy mosque, Paris. Stephen J. Trachtenberg, President Emeritus and University Professor of Public Service at George Washington University. Christopher DeMuth, Former President of the American Enterprise Institute. Norman Podhoretz, Former editor-in-chief of Commentary Magazine. Josef Joffe, Publisher-editor of Die Zeit. Katrina Lantos Swett, President of the Lantos Foundation for Human Rights and Justice, former chair of the U.S. Commission on International Religious Freedom. Dorothy Denning, Distinguished Professor of Defense Analysis at the Naval Postgraduate School. Chin Ho Lee, former FBI Special Agent and Senior Executive of the Hyundai Corporation. M.K. Narayanan, former Director of India's Intelligence Bureau, former Indian National Security Advisor and Special Advisor to Indian Prime Minister Manmohan Singh. Judge Ted Poe, Juris Doctor and former Representative of Texas’s 2nd Congressional District, Serving on Committee on Foreign Affairs and Committee on the Judiciary, and as Chairman of the House Subcommittee on Terrorism, Nonproliferation, and Trade. Anne Speckhard, Adjunct Associate Professor of Psychiatry at Georgetown University in the School of Medicine and of Security Studies in the School of Foreign Service. Rohan Gunaratna, Professor of Security Studies at S. Rajaratnam School of International Studies, Nanyang Technology University, and Head of International Centre for Political Violence and Terrorism Research, Singapore. Amb. Husain Haqqani, Former Pakistan Ambassador to the U.S., author, and Senior Fellow at the Hudson Institute. Father Patrick Desbois, head of the French Episcopal Committee for Relations with Judaism, advisor to the Vatican, and president of Yahad-In Unum. Deborah Lipstadt, Historian, Dorot Professor of Modern Jewish and Holocaust Studies at Emory University. Dr. Khaleel Mohammed, Professor of Religion at San Diego State University (SDSU) and faculty member of SDSU Center for Islamic and Arabic Studies. Alan Dershowitz, Felix Frankfurter Professor of Law, Emeritus, at Harvard Law School, and author of numerous bestselling books. Yehuda Bauer, Former Director of the International Institute for Holocaust Research at Yad Vashem. Magdi Khalil, Human rights activist, Executive Editor of the Egyptian weekly Watani International, and founder of Coptic Solidarity. Elie Wiesel, Recipient of the Nobel Peace Prize, Presidential Medal of Freedom, the U.S. Congressional Gold Medal, and the Medal of Liberty Award. Bernard Lewis, Professor of Near Eastern Studies Emeritus at Princeton University. Jeane Kirkpatrick, First woman to serve as United States Ambassador to the United Nations. Herb London, President Emeritus of the Hudson Institute. Richard Holbrooke, Special Representative for Afghanistan and Pakistan; Former U.S. Ambassador to the United Nations. Dr. Shaker Al-Nabulsi, Jordanian writer and University Professor. Edgar Bronfman, Former president of the World Jewish Congress, and president of Distillers Corporation-Seagrams Ltd.
Jack Kemp, posthumous recipient of the Presidential Medal of Freedom, former U.S. Secretary of Housing and Urban Development and former candidate for U.S. Vice President. Irving Kristol, Recipient, Presidential Medal of Freedom, 2002 and Former managing editor of Commentary magazine. James Q. Wilson, Professor of Public Policy at Pepperdine University. Max Kampelman, Recipient of the Presidential Medal of Freedom; Former Ambassador to the Conference on Security and Cooperation in Europe. Dr. Samuel Pisar, UNESCO Honorary Ambassador, Special Envoy for Holocaust Education and Polish-born Holocaust survivor. Lord George Weidenfeld, Former Vice-President, Oxford University Development Program. Dr. Khaled Fouad Allam, Algerian sociologist at the University of Trieste (Italy). MEMRI is committed to giving readers, in both the East and the West, comprehensive access to the primary-source material from the Arab and Muslim world that we translate. For this reason, English is the primary language into which we translate, and our translations into English are the most representative of the body of our work and our research. Therefore, we encourage our readers of other languages to avail themselves of our English-language archives whenever possible, since our archives in the other languages are not nearly as comprehensive. MEMRI's work directly supports fighting the U.S. War on Terror. Highly trained staff thoroughly translate and analyze open-source materials that include television programming, radio, newspapers, textbooks, and websites. Every single day, MEMRI receives requests from members of the U.S. government, military, and legislature. Since September 11, 2001, the demand for this material has significantly increased – providing thousands of pages of translated documents of Arab, Iranian, Urdu, Pashtu, Hindi, Dari, and Turkish print media, terrorist websites, school books, and tens of thousands of hours of translated footage from Arab and Iranian television. government & military affairs dept. MEMRI's Government & Military Affairs department assists all branches of the U.S. government and military, as well those on the state and local level. To date we have provided MEMRI research to counterterrorism departments in all 50 states. Members of the U.S. Senate and House of Representatives – from both sides of the aisle – seek out MEMRI for background information on the region and for expert knowledge on breaking news, as well as for general research. The U.S. Army, Navy, Air Force, Marines and Coast Guard utilize MEMRI material for cultural awareness training, mission support for soldiers, training aids, pre-deployment preparation, and much more. MEMRI has conducted briefings for the highest levels of the U.S. government, including the White House, Department of Homeland Security, Justice Department, State Department, the FBI, and many more. To learn more about how MEMRI assists the U.S. government, please visit our dedicated website. You can directly contact the Department of Government & Military Affairs here. MEMRI material is used extensively by government bodies and legislatures; militaries – both U.S. and foreign; media; academia; and the public at large. On a daily basis, MEMRI assists and lends support to all branches of the U.S. Armed Forces, including over 200 different units, in carrying out the War on Terror. MEMRI continues to support members of academia on a daily basis. To date, over 500 college and universities, in the United States and worldwide, have utilized MEMRI material. As MEMRI Board Member Professor Bernard Lewis said, "MEMRI is the single most important development in Middle East Studies in the past 25 years." Leading media outlets, both print and television, throughout the world frequently cite MEMRI. For more information about how MEMRI’s work is featured in the media, please see the MEMRI in the Media website.